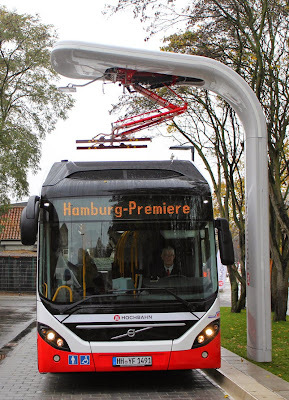 Officially launched at the International IAA Commercial Vehicles show, the Volvo 7900 Electric Hybrid buses equipped with a Siemens fast charging systems has taken its maiden tour in Hamburg, where it will be deployed from December on the 109 service. 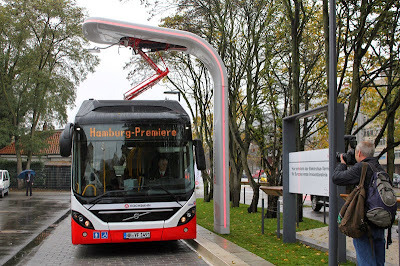 “Battery technology is becoming increasingly attractive for use in buses. The electric hybrid bus is an important further step for us on the way to procuring 100% electric buses. 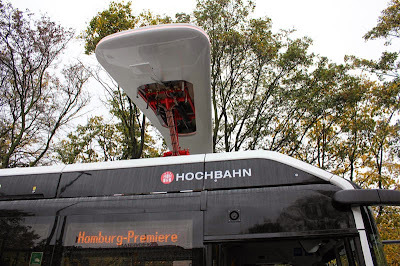 Hochbahn sees itself as industry's partner in gathering important experience in everyday service,” said Ulrike Riedel, vice president for operation and human resources at public transport operator Hamburger Hochbahn. The Volvo 7900 Electric Hybrid has an electric hybrid powertrain that combines a four-cylinder diesel 240 hp (177 kW) with an electric motor of 150 kW. The latter receives energy from a lithium ion battery of 19 kWh total storage capacity, this allows travel in electric mode a distance of 7 km between charges. The lithium-ion battery is charged via two charging rails on the roof. Fast charging stations have been set up next to the route with a contact arm fastened to a mast. If the bus is with range of the contact system, the drive operates the parking brake and charging will start automatically. Charging is performed fully automatically and ends as soon as the charging is fully completed. The process also can be cut short by releasing the parking brake. 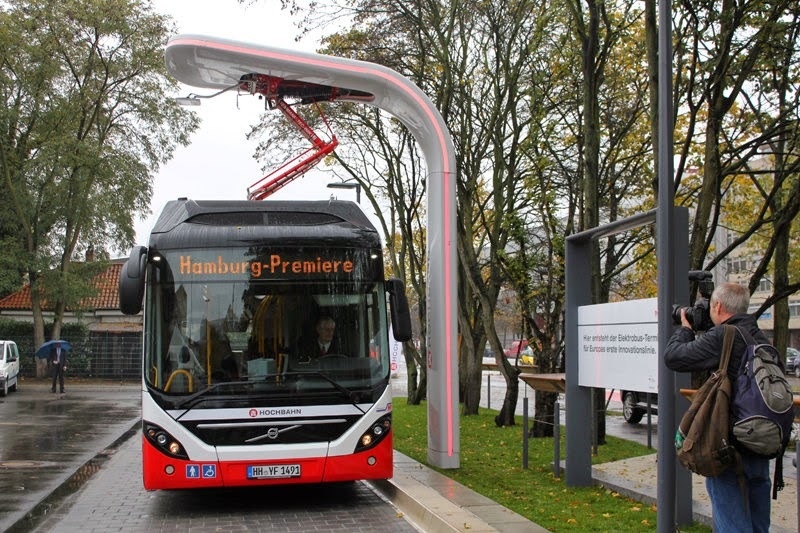 The fast charging stations in Hamburg are the latest development from Siemens for high-performance charging systems for electric buses. On the buses, it is only necessary to mount contact rails and a WiFi communication box. That saves space, weight, and costs on each bus. Communication between the bus and the charging station is established by WiFi. In this way, the bus is identified and the requirements of the battery management system are transmitted to the charging station. 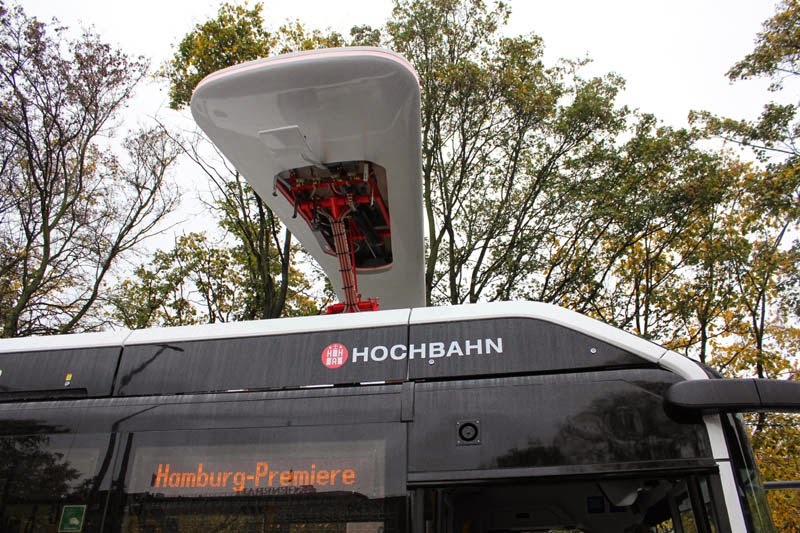 To make contact, the contact arm is lowered onto the charging contacts on the bus. The bus is electrically grounded before current starts to flow. The flow of current between the vehicle and the charging station is controlled continuously and matched to the individual charge state and battery type. The charging operation is completed in no more than six minutes.